I just returned from spending a week in Mississippi. It was a great trip: relaxing, lots of laughs, I’ve learned a few new great expressions and have come away with a much better understanding of why diabetes is an epidemic in America–to a great degree it’s the ubiquitous fry up. I was touring Mississippi with three girlfriends. A kind of “Ya Ya Sisterhood” on insulin. When my New York friends asked before I left, “Why on earth are you going to Mississippi?,” I told them, “Because I can.” I have always wanted to see part of the South with a Southerner. One of our Ya Yas grew up in Mississippi, so that was it: four diabetic women in a car soaking up the local life, comparing blood sugars every few hours, noticing how differently we all react to food and exercise, and in-between being charmed by the South’s hospitality and shocked, by how difficult it is to find healthy food. I didn’t realize, but Mississippi has been ranked “fattest state” for three consecutive years. Now hearing “Yes, maam,” repeatedly is admittedly some compensation for the lack of health-friendly food. Trust me, you will never hear it in New York. And my favorite new expression, “Bless your heart…” I’ve learned is extremely useful when you’re bad-mouthing someone but want to maintain a polite demeanor. And, yes, the pleasantries unrolled like an unfurling flag, and this troupe of women were lovingly and graciously hosted to lunches and toured through town after town. Tana, a fabulous cook, whipped up an incredible melange: cream of spring soup, shrimp Louie, southern mayonnaise biscuits with home-grown herbed butter and chocolate pots ‘specially for this Yankee, and actually welcomed me with my own signboard, boa and special guest, Marilyn Monroe. While I didn’t know (or care) what we would do in Mississippi, other than soak up local life, I found our tours revolved around visiting university campuses and churches. Initially, I kept looking for downtown and charming stores to poke my head into, being the New Yorker that I am, and it took me the first several days to realize depressed downtowns were not where life was any longer. It was on college campuses and at church. I experienced my first Baptist service, complete with a children’s choir, baptisms in what looked like the bell tower, singing, singing, singing and your requisite fervent preacher. Walking through a Presbyterian church, we lucked into hearing an amazing organist, and left with his CD gifted to us. We toured several antebellum houses learning about the history of the families that owned them and plantation life. Admittedly, when I walked into anyone’s house afterward I expected a tour. I was introduced to the very funny and bawdy series of books, The Sweet Potato Queens by Jackson, Mississippi author, Jill Conner Browne. 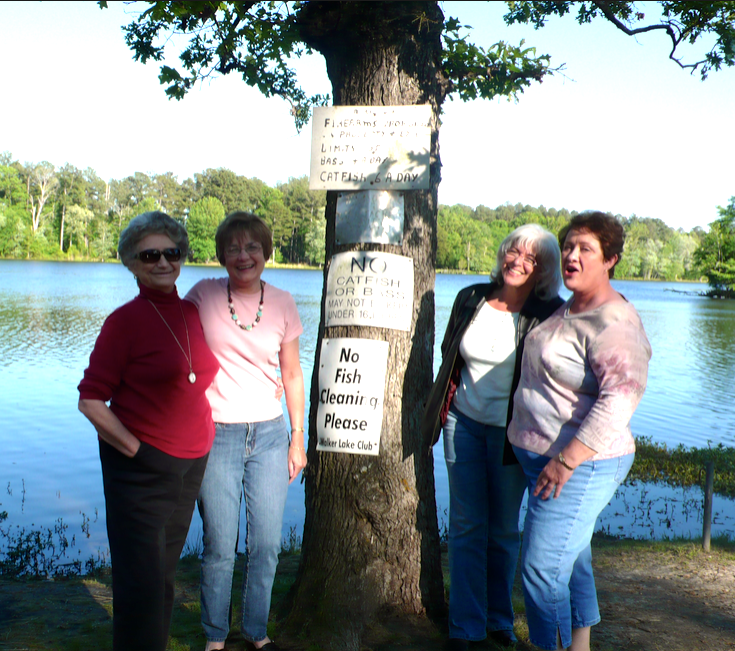 Our Tennessee gal-pal, Ann, read passages to us in her rich Southern drawl, with tears of laughter streaming down her cheeks, as we drove past tractors and catfish ponds. I ate one of the best meals ever at J. Broussard in Colombus, pecan-crusted catfish and a nutty buddy (you figure it out!). I sampled thirty different types of pecans (peecaaahhns) in a pecan (peecaaaahhn) store in Indianola, which was all of three streets long but seemed to be experiencing rush hour traffic while we were there. The friends and family of my native Mississipian asked me what I found surprising about Misissippi and I told them. It’s much more rural and green than I expected…people are very friendly and welcoming…many have been to New York — and love New York.. everyone goes to church, and the food, outside of a few truly fabulous restaurants, is growing our increasing population of diabetics. I, in fact, had a very earnest conversation about this with the President of Jones college in Laurel, Mississippi, Jesse Smith. Jesse Smith is a sort of President Obama–young and vital and making tremendous changes to the university to expand students’ potential and opportunities, and that includes healthier meals on campus. But throughout our trip my companions and I had to work really hard to eat healthy. Fried in Mississippi is a food group: fried chicken, fried steak, fried green tomatoes, fried pickles, fried okra, fried crawfish and on and on. If it was edible, it was fried. Then of course there are the staples: biscuits n’ gravy, chicken n’ dumplings, overcooked vegetables in lard and sweet tea, 1/2 cup of sugar in 1/2 a gallon of tea. My eyes were open widest looking at the aisles in the little superettes at each gas station where we stopped. Aisle upon aisle of chips, crackers, fried pork rinds, soda, fried meats, and, perturbingly nothing else. Except in one, which harbored a stand of books. “Bible Cure for Diabetes” intrigued me enough to buy it but also made me think: Would we really need a bible cure for diabetes if there were more fruits and salads available? So what will I remember from my trip? Outstretched hands and open hearts and the knowledge that all the segments I hear on the morning news about healthier food choices aren’t going to happen where it’s so hard to find them. As Dr. Smith explained to me, there was a time when the livelihood of Mississippi was based on people working the land. That required a lot of calories and a lot were burned off in their labor. Today, however, few people labor in the fields, yet the foods have not changed. Further, education about food and its consequence on health doesn’t seem to have reached many people, including the young people I saw working in the gas station superettes. On the last day of our trip we talked about how much opportunity there is to bring education to areas like this where it’s so vitally needed: A grass roots movement to teach people about the benefits of healthy eating like Governor Mike Huckabee is doing for Arkansas. So if anyone wants some wise women to consult on this, please do let me know, and, really, bless your heart. Over Passover I left my Apidra insulin and syringe on my brother’s dining room table where we had just finished the seder meal. We had all expected to go back in for dessert, but dessert happened spontaneously in the kitchen with everyone stuffing honey cake and chocolate covered strawberries into their mouths too engrossed in conversation to move back into the formal dining room. Thus, my insulin and syringe were left to themselves on the dining room table unnoticed, and I didn’t realize it until I returned home hours later. It wasn’t a big deal as I had extra insulin at home so I emailed my brother and asked if he would bring my insulin and syringe to a family gathering, a baby naming we would both be attending, two days later. Sure enough, when I saw my brother again, he handed me a little plastic baggie and inside, safely nestled, were my insulin and syringe. You should probably know at this point my brother and I never talk about my diabetes, except on the rare occasions when his ad agency is pitching a diabetes product and he comes to me to learn something, or find out something. I was 18 and he was 13 when I got it, and I have always felt while he is certainly sorry that I have it, the resentment he felt as a teenager who all of a sudden had his parent’s attention removed, started his drift away from me, and it has remained, and with it he has adopted a comfortable ignorance. However, as I took the baggie from his hand, I saw that little plastic container as a sign of tenderness, and concern. I imagined that his having to handle my insulin and syringe gave him pause to think about what it’s like for his sister to live with diabetes: To take injections several times a day, check her blood sugar throughout the day, and do all the other things I have to do; whether he really knows what they are or not, he knows there are things I have to do in order to live. I wondered too if it created a conversation for him with his two girls, 14 and 17 years old, who’ve never talked with me about my diabetes, but have seen occasional signs of it, whether it’s taking an injection or asking their mother what’s for dinner so I can figure out my carbohydrate intake and my dose. One day, however, I do think a real conversation will come along about living with diabetes, maybe it will come with his girls when they are old enough to get to know me on their own, not just the seven times a year they see me at holidays. Yet, unknowingly leaving my insulin and syringe behind, perhaps began a conversation, perhaps between my brother and his girls, perhaps between my brother and myself, just without words. And right now that’s O.K. For rather than get in anyone’s space, I prefer to just recognize that my lifeline came thoughtfully wrapped when my brother handed me my insulin and syringe in a little plastic baggie. A few days ago I was among about 400 people seated at Barnes & Noble for Mary Tyler Moore’s book signing. Her new book, Growing Up Again: Life, Loves, and Oh Yeah, Diabeteshas put her on the promotion circuit: Good Morning America, Rachel Ray, Barnes & Noble. I read the book and it’s a sort of stream of consciousness: a little bit Hollywood, a lot about being a recovering “bad” diabetic who’s learned some lessons and is still confronting others. I found it surprising how hard she is on herself, but from what she discloses about her upbringing, and she is very open, she had two parents who never gave her much attention or approval. Ms. Moore is donating all of her proceeds from the book to the charity she champions, the Juvenile Diabetes Research Foundation (JDRF). Reason enough in my book for her to write her book. What I particularly like about her book, is it gives us adults with type 1 a face, and a place, in the diabetes community, making us a little more visible. After Mary stepped out in front of the group awaiting her, and spent a few minutes graciously answering people’s questions, which ran the gamut from, “What was it like working with Elvis Presley?” (if you know she was the last of Presley’s leading ladies then you’re a fan!) to, “What’s happening with the artificial pancreas?”, she sat behind a big desk with about four protective handlers and we were invited up to the stage row by row to have our book signed. I stood in line carrying her book, and my own book, The ABCs Of Loving Yourself With Diabetes, which I intended to give her as a gift–if I could get it past the handlers. It would take some quick strategizing to not have the four strongarm men and women standing around her grab it out of my hands and hurl it out the window behind her. Then, just when my moment arrived: I’m in front of her, she begins to sign my book, I lift my own book up to table height to hand it to her, pow–the man to my right (meaning he was BEHIND me in line!!!) asks her a question. Her attention now diverted, I wanted to clobber him. You’ll be glad to know I didn’t. No, I just waited. She finished signing my book and picked it up to hand to me, and that’s when I extended my book out to her and said, “I hope you’ll accept this as a gift from me to you, my book.” She looked at it, and since I know she has a vision problem, I said the title aloud, whereupon she said, “Thank you, Riva.” I quickly calculated she must have read my name on the cover. Three sweet little words, “Thank you, Riva.” Well, c’mon, I did watch her every Saturday night laughing it up with Rhoda. Then, as if on cue, the strongarm woman to her right, whisked my book from her reaching hands and put it in a bag behind her. So, will my book really ever be read by Mary Tyler Moore? Who knows…but when my husband and I got home there were two voicemail messages on our machine. Before we played them I said to him, “I’m sure they’re from Mary calling from her limo to thank me for the book!” They weren’t, but you never know, tomorrow is another day. A few weeks back I mentioned that I read an article in Diabetes Health magazine, Medical ID Bracelets: The $15 Lifesavers that made me realize it was a foolish move on my part not to wear a medic alert bracelet, especially since I have enough lows to warrant it. Granted, I haven’t had a low yet in 37 years I couldn’t remedy myself, but why take chances? I’m quite pleased with my bracelet so far, it’s small and shiny. My friend who makes jewelry volunteered to make me a lovely chain for it. I think I’ve managed to hit the right balance of “Look, I have a condition that needs care” and an unobtrusive, simple and fine piece of jewelry. The plaque doescome with a free chain or you can select from three chains all priced at $6. Stay tuned. I’ll show you the whole thing once done. I’m actually looking forward to being able to wear this, and intend to leave it on my wrist once I put it there. I just watched Michael J. Fox in his appearance on the Oprah Winfrey show this week. Yes, working for myself gives me the liberty to take a break at 4 P.M. and recharge my batteries. Fox is an emblem of living gracefully with chronic illness. If you don’t know, he’s had Parkinson’s disease for the past 18 years, and looks just as youthful and boyish as he always has. Just now he shakes–a lot. Oddly, he said, the shaking is not from the illness, but rather the medication for Parkinson’s. If not for the medicine, his muscles would freeze. But there’s certainly nothing frozen about his mind, his enormous optimism, or his activism. Fox has gone to Washington repeatedly to seek funding for stem cell research and Obama has just passed legislation to make that possible. Of course where was Fox? Not in Washington, but climbing the Himalayas in Bhutan. He joked, it’s not so easy to get out of the Himalayas at a moment’s notice. He also told us that while there his disease affected him less. He could breathe more easily, odd because such altitude usually hampers breathing, and his muscles moved more fluidly. We also saw a demonstration in a segment of him playing ice hockey: he looked little different than his younger self who was an amateur player growing up in Canada. 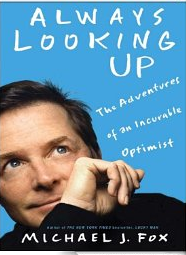 Part of Fox’s appearance was also to promote his new book, Always Looking Up: The Adventure of an Incurable Optimist. And that was the face of illness that we saw: someone who is accepting, living fully and treasuring each small moment with his wife and children, someone who even savors the turn his life has taken saying if this hadn’t happened, he wouldn’t have met the amazing people he’s met and done the amazing things he’s done.” And, we got that he feels his life has been enriched. Some days he has more trouble tying his shoelaces than others or his medicine kicks in too slowly to avoid an incident he would not have asked for, but he said that vanity was the first thing to fly out the window once his symptoms began to show. And that he is not afraid, but eating life. As Fox says, “Parkinson’s doesn’t define me, it’s just one part of my life.” He also tells his children when they ask about his shaking, “My brain doesn’t work the way yours does.” How simple those few words are. So simple, a child can understand, and it leaves judgment out the door. It’s we adults who have to struggle to see past the jerky movements and our assessments based on outer appearances. Well, my pancreas doesn’t work the way yours may, so I’m a little different, not damaged or less than. That thought gave me a new window from which to see my diabetes. I think Fox truly is inspirational and an example of how to live with a chronic illness. He wears it well and so can we.